Curry fish head is a popular dish amongst Singaporeans. 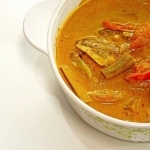 It is the liking of the fish head by the Chinese with the use of traditional South Indian fish curry recipe that some say this is a true blue Singapore recipe which was first surfaced back in 1952 at Mt. Sophia! While we are unsure of the origin of this recipe, there is one thing that we are truly certain and that is history has been really kind to us! Keeping such wonderful delicacy to our current generation and not much was lost in transition over the past 64 years! The Fish Head Curry is also one of Mdm Cheng’s favourite home cooked food, which she usually only cooks it during special occasions for her family and relatives. Many thanks to Mdm Cheng for all her selfless sharing so far! She has been sharing her delicious food recipes with us just so that we can create these wonderful cooking videos for you. Assam Curry Fish Head recipe provided below, start cooking now! Fish Head Curry is a popular dish amongst Singaporeans. It is the liking of the fish head by the Chinese with the use of traditional South Indian fish curry recipe that some say this is a true blue Singapore recipe which was first surfaced back in 1952 at Mt. Sophia!